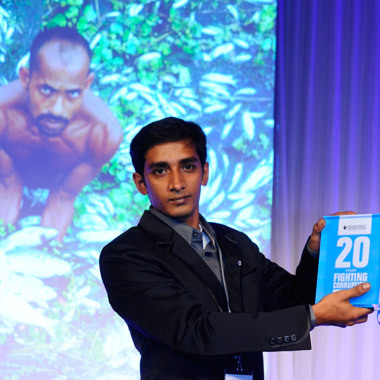 Photographer Sony Ramany of Bangladesh with his award at our 20th anniversary celebrations. Just one image can tell a story, says Sony Ramany, winner of our 20th anniversary youth photo competition – and these stories have the power to spark real change. “We need to show images of suffering and hardships,” he says, “so that people can see the truth”. A photographer from one of Bangladesh’s leading English-language newspapers, Sony has seen first-hand the impact a photo can have on the world around him. Documenting life in Bangladesh, the 21 year-old photojournalist captured a hard-hitting image of chemical dumping in Dhaka’s rivers. His photo – a startling image of a man stood in murky water and sludge, surrounded by piles of dead fish – sparked a public outcry in Bangladesh’s capital, helping put pressure on the government to take action against toxic waste from the tanneries and factories that line Dhaka’s waterways. When we opened our global call for young photographers to send us their images of corruption, Sony’s editor pushed him to send in his photo. It won first place. We spoke to Sony last week when he came to Berlin to accept his prize during our 20th anniversary celebrations – asking him how he found the image, what happened next, and what he would say to other would-be corruption fighters. Our youth photo competition invited young photographers to illustrate the effect corruption has on their world. Why did you choose an image of industrial pollution in Dhaka’s rivers? Fisheries are a big issue in Bangladesh. The industry is central to our lives, but pollution from factories on the banks of rivers is threatening it – particularly from garment factories. Bangladeshi high courts have ordered them to address the problem, but many factory owners still aren’t bothered about where their chemicals go. How did the image come about? I first met the man in the photo when I was visiting the area on a different project. He told me that the fish in his reservoir die every year during monsoon season, when chemicals from the sewers and streets flood the water. I gave him my telephone number and I told him to call me as soon as it happened again. One morning, about a year later, I received a call. It was the man. I went over immediately – there were dead fish everywhere. When I showed the images to my editor, he asked for it to be printed across the back pages of the newspaper. What was the response to the photo? People were inspired. A lot of outlets wanted to publish the photo, and people started asking what could be done to stop the pollution. Previously the government had ignored the problem, now they couldn’t. After the photo was published they ordered the river to be cleaned-up. What would be your message to other young people who are thinking of speaking out against corruption? I would tell them that that we need to work together to get rid of corruption. Young people need to start with themselves, and then they need to tell their friends and their colleagues to stop corrupt behaviour. That way, we can stop corruption. Sony Ramany is a photographer from Dhaka, Bangladesh, where he works for New Age, a leading English-language daily. Sony says that he decided to be a photographer because of the power of images to tell stories that resonate with everyone – even those who cannot read or write. “Everybody can contribute positively to his or her society through their work to make it a better place to live. I have chosen through my profession to fight against the odds and the factors that make me a victim within my own society,” he says. Ramany’s prize-winning shot helped put pressure on the government to take action against chemical dumping in Dhaka’s rivers.